320. The functions of plant-life are two-fold, namely, vegetation and reproduction: the former looking to the preservation of the individual plant itself, the latter to the species. Corresponding with this view, there are also two classes of organs. Having considered the former class, that is, the organs of vegetation, we come now to the organs of reproduction, including the flower, the fruit, and the seed. 321. Inflorescence is a term denoting the arrangement of the flowers, and their position upon the plant. 322. Origin of flower buds. All the buds of a plant are supposed to be originally of one and the same nature, looking to the production of vegetative organs only. But at a certain period, a portion of the buds of the living plant, by an unerring instinct little understood, are converted from their ordinary intention into flower buds. 323. Proof of this theory. That this is the origin of the flower bud is evident from the known effects of cultivation, causing it to revert partly or wholly to its former intention, as in the green rose, when the petals, etc, all return to leaves; in the proliferous rose when the axis grows on through the flower bearing leaves above it In some instances the skillful gardener learns how to effect this interchange of nature in the buds at pleasure. 324. Hence in position and arrangement flower buds can not differ from leaf buds, and both are settled by the same unerring law which determines the arrangement of the leaves. Accordingly the flower bud is always found either terminal or axillary. 325. A single bud, whether terminal or axillary, may develop either a compound inflorescence, consisting of several flowers with their stalks and bracts, or a solitary inflorescence, consisting of a single flower. 326. The flower-bud is incapable of extension. While the leaf-bud may unfold leaf after leaf and node after node to an indefinite extent, the flower-bud blooms, dies, and arrests for ever the extension of the axil which bore it. 327. The peduncle is the flower-stalk. It bears no leaves, or at least only such as are reduced in size and changed in form, called bracts. If the peduncle is wanting the flower is said to be sessile. 328. 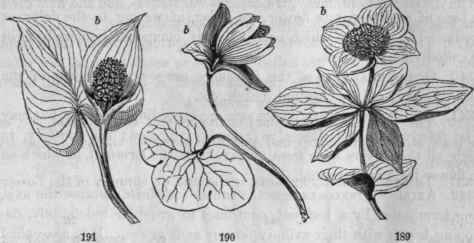 The simple peduncle bears a single flower; but if the peduncle be divided into branches, it bears several flowers, and the final divisions bearing each a single flower, are called pedicels. 329. The scape is a flower-stalk which springs from a subterranean stem, in such plants as are called stemless or acaulescent, as the primrose, tulip, blood-root. Like the peduncle it is leafless or with bracts only, and may be either simple or branched. 330. The rachis (paXις, spine) is the axis of the inflorescence, or the main stem of the compound peduncle along which the pedicels are arranged. 331. The torus or receptacle is the end or summit of the flower-stalk. Anomalous peduncles. 185, Linden-tree. 1SG, Butcher's-broom. 187, Xylophylla.l88,Cockscomb. 332. The peduncle is subject to endless modifications. We find it sometimes excessively lengthened, again very short or wholly wanting; very slender or very thick. 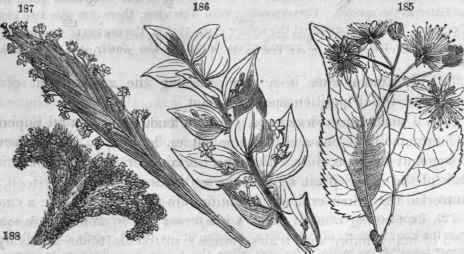 In cockscomb its branches are blended into a thick, fan-shaped mass; in butchers-broom it expands into the form of a green leaf, and in the linden-tree into a seal-like bract. In Xylophylla it is foliaceous, bearing flowers along its margins. 333. Bracts. The branches of the inflorescence arise from the axils of reduced leaves, called bracts. These leaves, still smaller, growing upon the pedicels, are called bracteoles. 334. The bracts are usually simple in outline and smaller than the leaf, often gradually diminishing to mere points, as in Aster, or even totally suppressed, as in the Cruciferae. 335. In color they are usually green, often colored, sometimes brilliantly, as in painted-cup. Sometimes they are scale-like, and again they are evanescent membranes. Bracts b, b, b,). 189, Cornus Canadensis, with an involucre of 4 colored bracts. 190, IIepatic3 triloba, with an involucre of 3 green bracts. 191, Calla palustris, with a colored spathe of one bract. 337. Involucre when they are collected into a whorl or spiral group. In the Phlox, Dodecatheon, and generally, the involucre is green, but sometimes colored and petaloid, as in dogwood and Euphorbia. Situated at the base of a compound umbel, it is called a general involucre, at the base of a partial umbel it is a partial involucre or in-volucel, both of which are seen in the umbelliferae. 338. In the compositae, where the flowers are crowded upon a common torus, forming what is called a compound flower, an involucre composed of many imbricated scales (bracts) surrounds them as a calyx surrounds a simple flower. The chaff also upon the torus are bracts to which each floret is axillary. 192, Helianthus grosse-serratus. 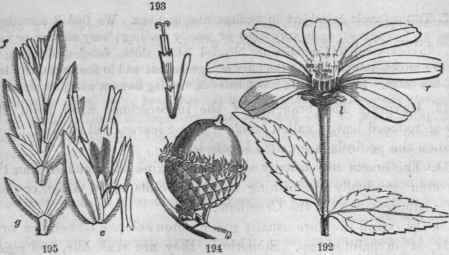 I, involucre; r, rays, or ligulate flowers; 193, one of the disk flowers with its chaff-scale (bract). 194, Acorn of moss-cup oak (Q. macrophylla). 195, Poa pratensis; f, spikelet entire, g, glumes, separated; c, a flower separated, displaying the two paleae, 3 stamens, and 2 styles. 339. In the grasses the bracts subsist under the general name of chaff. The bracts situated at the base of a spikelet of flowers, are called the glumes, corresponding to the involucre. Those situated at the base of each separate flower are paleae, answering to the calyx or corolla. The pieces of which each calyx is composed (generally two) are called valves or pales.